What's a good software solution to slow down internet connections on the mac for testing and simulations? My primary need is when testing code in the iPhone / iOS simulator, so slowing down the connection for specific applications or processes would be great. Apple has made a very handy official tool to slow down the network connections on you Mac for testing purposes. 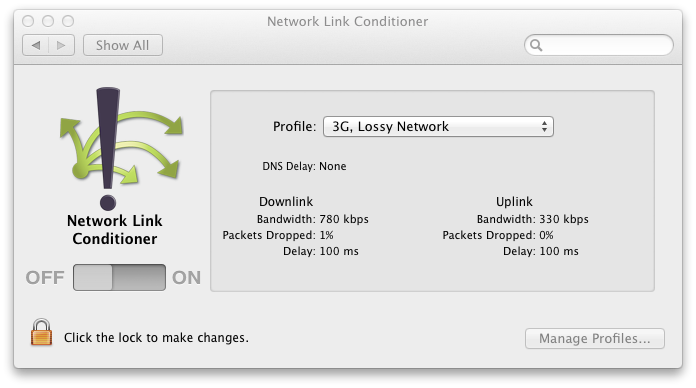 The Network Link Conditioner preference is a free download from within Xcode (for Lion and later OS). Additionally, iOS has similar function accessible from within Xcode and iOS 6 or later. Older versions of Xcode before version 4.3.2 embedded a copy of this tool. Now, you use Xcode to download it directly in a similar manner to the iOS simulators and developer documentation. There are 11 built in profiles from a Lossy Edge network with 400ms delay to a cable modem. If you need other limits, you can create custom profiles with your own settings or you can also use ipfw yourself as described in Craig Hockenberry's article slow ride, make it easy It also mentions the Speed Limit panel by Mike Schrag that is a smaller download than Xcode, but has fewer options than Apple's tool. It slows down the entire network stack, so you can't throttle on a per app basis without doing things like install lion in a virtual machine and set that VM with a throttled stack. OS X 10.9 and earlier provide ipfw and it allows you to define custom firewall rules. Create a pipe with limited bandwidth using ipfw and you can run your tests and simulations. Port 80: standard port for unencrypted http traffic. This port is used for most browsing and downloading. You should be fine with this in most cases. Port 443: standard port for SSL encrypted https traffic. Speed Limit is a System Preferences pane for intentionally and selectively slowing down specific ports and domains. If you only need throttling for Web development, I can wholeheartedly recommend Charles. It's an excellent tool for debugging HTTP applications anyway, and among its many features, it's got a Throttle option. The software isn't cheap, but it does an excellent job. To add to the accepted answer: it looks like you shouldn't need XCode, just an account at the Apple Developer website (simpler than first downloading the 2GB XCode package if you don't have it already). Go to https://developer.apple.com/downloads and search for "Network Link Conditioner" or "Hardware IO Tools for XCode", the latter being the name of the package it's found in. You can also use ipfw piping to slow down your network. Mac OS X 10.10+ users need to use dnctl and pfctl but documented usage examples aren't easy to find. # Configure `pfctl` to use `customRule`. # Define `customRule` to pipe traffic to `pipe 1`. I believe this also affects localhost pipes which slowed down my vs-code debugging, so be mindful of that. For XCode 10.2, in More developer tools - Additional Tools for XCode 10.2, you will find Network Link Conditioner. Kiran Jasvanee is a new contributor to this site. Take care in asking for clarification, commenting, and answering. Check out our Code of Conduct. Not the answer you're looking for? Browse other questions tagged macos mac network performance internet . what can be used (like netem in linux) to control network on macOS? How can I simulate having a slow CPU? Can a Mac's airport card run 802.11 N, G, B or A only? How to throttle usage of individual computer with Apple Airport? How can I tell which application is using the network? How can I control (start/stop) applications and services that start up after reboot? Can I control my Mac with my iPhone — over Bluetooth?